I've been interested in using more vinegars in the kitchen, and a book loaned to me by my Homesteading Hook-up is Preserving the Harvest. In it is a section on infusing your own vinegars (along with some wonderful preserving tips and recipes). 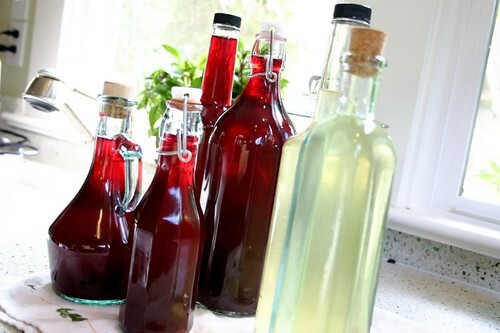 And years ago, I had clipped a recipe for Blueberry Basil Vinegar and stuck it in my stash. So I suppose I've been ruminating on vinegars for some time. Who knew? Well, all that rumination came to be a few weeks ago when I purchased a few big bottles of white and apple cider vinegar, and tracked down a variety of berries and herbs. But then there were the bottles. Oy. IKEA has some, but they're pretty large. A variety of other stores were scoured, and a sampling of bottles showed up. But then on CraigslistI discovered my local coffee shop was looking to find a home for their many, many syrup bottles they were acquiring so I popped in and took a few off her hands. Free! They still have more, so if you're seeking glass bottles for projects, hop to. First off, the Blueberry Basil vinegar. In a big monster jar, I dumped blueberries and shredded basil and after making a vinegar/sugar slurry, poured that in. See? Shut the lid, and down to the basement it went. The strawberry vinegar required a little cooking, but the mint vinegar was as easy as pie (wait, pie isn't easy). And last night? 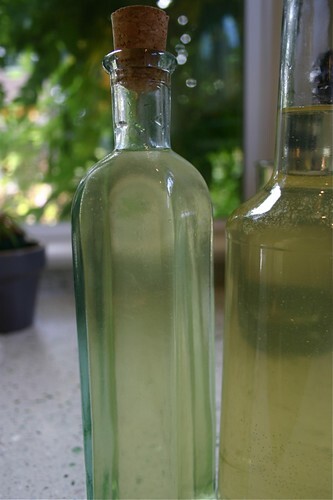 We strained and sterilized and bottled our vinegars. The mint vinegar is really tasty with fish and fresh vegetables. 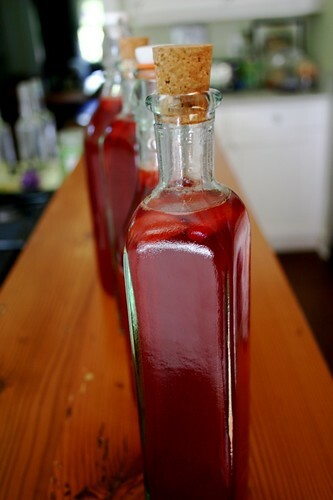 The strawberry vinegar I'm looking forward to using with pork this winter and with cabbage as a coleslaw. And the blueberry basil makes a fantastic salad dressing combined with olive oil. Quick easy flavors that pack a punch and enhance food, especially vegetables and proteins: all created with the bounty of the summer season. But mainly, these are to give as gifts at the holidays. 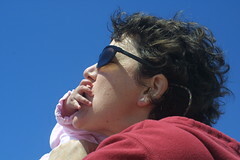 Sssshhhhh. 1. In a half gallon container bruise the mint leaves with the back of a spoon. 3. Store in two 1 quart jars, capped and sealed, at room temperature for about 2 weeks. 4. Filter into three clean containers and add afresh mint sprig for beauty. Store tightly sealed in a cool dark place for up to 6 months. 1. In a large 4 quart nonreactive saucepan combine berries and vinegar. Let stand for 1 hour. 3. Use a coffee filter to strain into three sterile 1 pint bottles. Press out as much juice from berries as possible. 4. Add some of the reserved strawberries to each bottle. Cap, seal label. Store in cool dark place for 2 weeks before use. 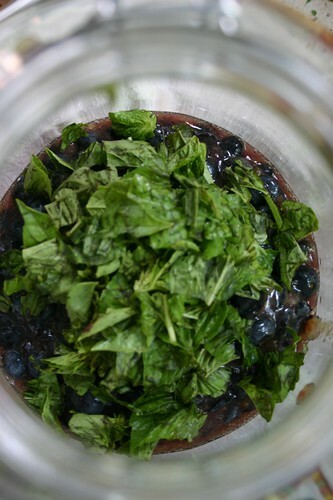 Combine crushed fresh blueberries and 1/2 cup torn basil in large sterilized wide mouthed jar and set aside. Place vinegar in a medium nonaluminum saucepan and bring to boil. Pour hot vinegar over blueberry mixture, cover jar, let stand at room temp for 2 weeks. Very pretty, I've meant to do this forEVER, even have saved pretty bottles. Can I call the strawberry vinegar? Pretty please with strawberry on top? This is WONDERFUL on all levels. Isn't it fun to be a concoctionist? Also, I'm very intrigued by that green witchcraft book you mentioned. Do post about that at some point (pretty please). Those are beautiful! and I bet they taste good too. Some of those vinegars look wildly good. Thanks for sharing the recipes. P.S. It was great meeting you the other day! My blueberries went crazy this year, and this is a great way to use my last crop! Now what to do with those raspberries that I can't pick fast enough. Blueberry raspberry vinegar! Have a recipe for this combo? Ah! This is lovely! I'm so happy to find your thoughts on infusing vinegars. I'm playing around with it in this little kitchen of mine and hope to be as creative with it as you have!